2005 Aprilia MX 50. Picture credits - Aprilia. Submit more pictures. THE WINNING MIX! It�s the trend of the moment, the latest challenge in the motorcycling world, a new way of conceiving and living two wheels� It�s the super motard phenomenon - a thrilling, incredible, adrenalin-packed mix of motocross, enduro and racing to take off on both track and road. Rear suspension: Swing-arm in box section steel, with anti-friction bushings, adjustable monoshock with Aprilia Progressive System action. Seat height: 1,340 mm (52.8 inches) If adjustable, lowest setting. Ask questions Join the 05 Aprilia MX 50 discussion group or the general Aprilia discussion group. 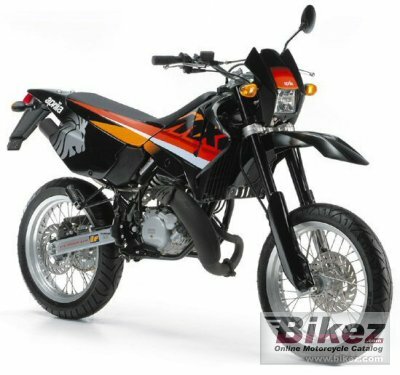 Get a list of related motorbikes before you buy this Aprilia. Inspect technical data. Look at photos. Read the riders' comments at the bike's discussion group. And check out the moped's reliability, repair costs, etc. Show any 2005 Aprilia MX 50 for sale on our Bikez.biz Motorcycle Classifieds. You can also sign up for e-mail notification when such mopeds are advertised in the future. And advertise your old MC for sale. Our efficient ads are free. You are also welcome to read and submit motorcycle reviews.